Late in the fall of 1950 some vague rumors were circulating that Newton Drury was considering going back to California. Then, in February, Associate Director Arthur Demaray disclosed that he was thinking of retiring in April. He had spent some forty years in government service, including thirty-four years with the National Park Service, of which he had been associate director for eighteen years. But before Demaray had a chance to retire, Director Drury announced his decision to resume his work with the Save-the-Redwoods League and to accept appointment as director of the state parks of California, which had been offered him by Governor Earl Warren, a classmate of his and of Grace and Horace Albright's at the University of California. Secretary of the Interior Oscar L. Chapman informed me that he was planning to appoint me director of the National Park Service but wanted to offer the job first to Arthur Demaray if he would stay on. He asked me if I would talk to Demaray to see if he would defer retirement if appointed director. Chapman wanted to honor Demaray by giving him the directorship before he retired. I too felt Demaray deserved the position and urged him to accept the appointment, and he agreed to stay on for a short time. 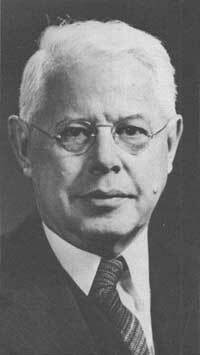 Newton Drury's resignation took effect on March 31, 1951, and Demaray took office the following day. I was appointed to succeed him as associate director. Arthur E. Demaray, director of the National Park Service from April 1, 1951, to December 8, 1951. Demaray had done a considerable amount of work in connection with budget and legislative matters and had represented the director on the planning and zoning commissions for the city of Washington. When he became director he assigned many of these responsibilities to me. As associate director I began to appreciate the tremendous amount of work that the Administrative Branch under Assistant Director Hillory Tolson did in preparing the budget and justifications. In October, Director Demaray announced that he was going to retire on Friday, December 7. I entered on duty as director on Saturday, and my first day in the director's office was Monday, December 10, 1951. Chapman and Demaray had timed their moves in accordance with the fact that 1952 would be an election year. Though the Park Service was a career service, there was always the chance that a new secretary might try to change that status. I'm very sure that Chapman and Demaray both felt that the new director should be in office at least a year before the beginning of the term of the next secretary of the interior, and that was expected to be January, 1953, whether the Democrats or Republicans won the 1952 election. In other words, I had a year to prove my capability in order to avoid the possibility of the director's position becoming a political appointment. As it turned out, Secretary Chapman left office January 20, 1953, when the Eisenhower administration came in. Oscar was a politician and a very, very good one. He was a strong believer in the principles of conservation and in what we in the Park Service were doing. He went out of his way to be helpful. I'm sure he felt that the profession of politics required many of the qualities that a good administrator should have. He believed strongly that a good job well done was the best politics. He was always courteous, smiling, and reasonable, and I developed a personal affection for him. I may be a little biased, because it was he who promoted me to the directorship of the National Park Service. I will confess that nearly every day since my talks with Secretary Chapman and Arthur Demaray in March I could not help but think and plan for the time when I would be director, and as I did my self-confidence got stronger and stronger. I analyzed my abilities and considered what things should be done differentlynot that the way they had been done in the past was wrong but that my own approach would be different. Of one thing I felt certain: if my administration was to be a success, it must earn the full support of the park people in the field. True, I was a civil service career person with a good background and considerable experience, but all of my twenty years with the National Park Service had been in the Washington office. I had had a lot of contact with the field people and had spent much time in the field, but I felt very strongly that I needed a well-qualified, highly respected field man to share in policy-making and administrative responsibilities if my administration was to be strong and responsive to the field forces. They were the real troopers in the front-line trenches who protected the parks and gave the kind of service the people had a right to expect. A statesman-politician in the finest sense of the term, Oscar L. Chapman served ten years as assistant secretary, two years and eight months as undersecretary, and three years and eight months as secretary of the interior. Photo by Abbie Rowe, courtesy National Park Service. During the eight months of Demaray's incumbency as director I had given considerable thought to several other things that seemed very important to me. First, and of utmost importance, as director I wanted to know the Washington office personnel intimately. I wanted to hear them express themselves on various problems and subjects pertaining to management of the National Park Service. In order to do that I established, starting in February, 1952, a regular squad meeting every Monday morning. The squad consisted primarily of branch chiefs, together with one or two other special assistants to the director. At these meetings we discussed general policy, work accomplished, and important matters that should be handled and who was to handle them. I also set up staff meetings for the first and third weeks in each month. The purpose of these sessions was to let the staffthe branch heads and their division chiefs and any special assistants they would like to have presenttell in their own way of their accomplishments and express any ideas they wished to expound. The meetings took on a seminar quality and were very enlightening to me. They gave us all better insight into the various problems encountered from day to dayproblems that we perhaps would never have heard about if it were not for those meetings. Second, I wanted to reestablish what was known as the superintendents' meetings, and I wanted these meetings held in the parks and not in Washington. We had discontinued them during the war and the following cold war period because of lack of funds. Although they were called superintendents' meetings in the thirties, they were organized by the Washington office, and the papers given were prepared mostly by the Washington office staff. The field staff found this disturbing. I felt that the superintendents should organize their own meeting, subject to review in the director's office, that papers given by the Washington staff should be limited to very important policy subjects, and that the rest of the session should be an open forum, sort of an old-fashioned town meeting. Thirdand very importantthe Park Service ever since the Mather and Albright days had paid a great deal of attention to budget and legislative matters and to relationships with members of Congress, and I wanted to be sure that there was no slippage in these efforts and try if possible to improve them. The Park Service had a lot of friends on the Hill: the result of good service, sound budgets, and carefully drawn and reasonable legislation. Quite a few people on the Washington staff knew various congressmen personally, and we encouraged them to increase and enhance these friendships wherever possible. For instance, on the House Appropriations Committee the chair man, Mike Kirwan, was a very good friend of mine, and Ben Jensen, of Iowa, the minority leader of the subcommittee handling Park Service work, was a very close friend of Hillory Tolson's. A few days before our hearings on the budget, Mike Kirwan and I would discuss our request in his office. These talks gave me an opportunity to indicate to him both the needs that we were unable to include under our budget ceiling and, if the committee felt they had to reduce our request, which items we considered absolutely essential. I'm sure that Hillory Tolson did the same with Ben Jenson, especially when Ben was chairman. On the Senate Appropriations Committee we had Carl Hayden, of Arizona, and Guy Cordon, of Oregon. Most of our matters before the legislative committees had to do with special items, and nine times out of ten these matters applied to a state, or maybe two or three states, for establishing new park or recreation areas. In cases where the representatives and senators from the states involved wanted a bill reported favorably the committee usually did so. 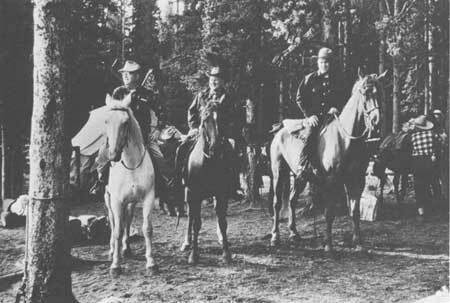 The first superintendents' meeting in the new style was held in the fall of 1952 in Glacier National Park. We discussed it in advance in the squad meeting and selected two superintendents to organize the meeting. We suggested that at least two or three afternoons be set aside as discussion periods in which people from the floor could address the director and his staff, outline problems, and ask for clarification or change of policy. The meeting in Glacier was a lively one, and we gave answers to questions right on the spot whenever possible, confirming them in writing within two weeks after the meeting. Written response was given as promptly also to questions that could not be answered from the platform. There were only about four or five out of some forty or fifty issues raised that we had to delay answering until we got back to Washington and checked the law or the administrative policies of the secretary. The last night of the superintendent's meeting there was a banquet. Howard Hayes, who was president of the Glacier Park Company, the National Park Service concessionaire for Glacier National Park, had arranged with the Blackfoot Indians to make the new director an Indian chief. Two of the biggest, huskiest Indian chiefs I had ever seen, all decked out in ceremonial dress with strings of beads, feathered bonnets, and what not, came to the platform along with an interpreter. They talked to me in their native language while the interpreter translated their words into English and my replies into the Blackfoot language. They finally put a headdress on me with the finest colored Indian feathers I'd ever seen. I was told that I was a "blood brother" and that my new name as a chief of the Blackfoot Indians was Curly Bear. I thanked them, and then in a facetious way I told them I had read in the newspapers that wethe Blackfoothad struck oil on the reservation and that now as a blood brother I assumed I would share in the profits. Before the Indian translator could pass this along, one of the chiefs turned to me and said, "Hell no!" in very good, loud English accompanied by a scowl that led me to believe he didn't think I was kidding. He snatched the Indian bonnet from my head, we shook hands, and the Indians left the stage. Mike Mansfield, then the congressional representative from that district, was present and was highly amused. All told, the meeting was a howling success. One of the greatest benefits of a meeting of this kind was getting people together where they could talk things over and get to know and understand one another better. We decided that future meetings should be held in odd-numbered years to avoid national election years, when political candidates might seek to get good local exposure. For the Glacier meeting we had received a letter from the headquarters of one of the major political parties offering to place a speaker on our program, but of course we declined. The next meeting was therefore held one year later, in 1953, in Yosemite National Park, and from then on the meetings took place every two years. These meetings paid big dividends; they were great for morale building, and they provided every superintendent, from the smallest park to the largest, equal opportunity to bring up any problems he felt ought to be discussed. They were a service not only to the superintendents but also to the branch chiefs in the Washington and regional headquarters. They gave all those attending a far clearer idea of the workload and the requirements of the field and the problems of the Washington and regional offices. But the biggest dividend as far as I was concerned was the firsthand insight I got into the ability, character, and habits of the key people of the service, which was particularly helpful in selecting people for promotion. Knowing that I was to become director a number of months before I was actually appointed enabled me to give considerable thought to the selection of an associate director, the number two man. I knew that from the standpoint of service morale as a whole a field person should be selected for that position if at all possible. Had it seemed otherwise, the logical choice would have been Hillory Tolson; but although Hillory was a sincere, very capable, and loyal National Park Service man, he had been pretty well fastened to the Washington office during his entire service, as I had been, except for the short time he had been regional director in Santa Fe. By the time I took office I had made up my mind that I needed a park superintendent as associate directora person with a good record who would be thoroughly acceptable to the field forces. He also had to be a person who could work with both Hillory Tolson and me. The one field man who came to mind almost every time I started thinking about filling the job was Eivind T. Scoyen. Although getting close to retirement, he was held in high regard by everyone. He had been superintendent of Sequoia and Kings Canyon national parks in California since 1947 and had literally spent his whole life in the national parks. He was born in Old Fort Yellowstone at Mammoth Hot Springs, headquarters for Yellowstone National Park before the National Park Service was established, and had been a ranger in the early Mather days. In length of service and field experience, he was senior to both Tolson and me. I finally selected him, and he entered on duty in Washington on January 17, 1956, just as Mission 66 was getting under way. I could not have made a better choice. He had everything I needed in that position and fitted right into the Washington office. When Dwight D. Eisenhower took office as president of the United States in 1953, he appointed Douglas McKay, former governor of Oregon, as secretary of the interior. I liked him from the day I met him. I went to him with a memorandum about the National Park Service and told him that I was the director, that I liked working at that job, and that I thought I could do a good job for him, but that if he felt somebody else in the Park Service would make a better director, I would step aside and would appreciate getting my old job back in the Park Service. He smiled and said he had given some thought to that and had come to the conclusion that I had to stay in the job and he wouldn't think of replacing me under any circumstances. He believed strongly in the career service, and while I had been in the job as director for only a year, he had nothing but good reports about the Park Service. It was in Doug McKay's term of office that we came up with Mission 66, and he certainly supported that programevery feature of it. Well, Oscar Chapman is my friend, and I am not going to say anything about his water policy.... I have the Chevrolet agency in Salem. I have been in business for quite a few years and I learned a long time ago to tell a customer coming into my shop about Chevrolet, all the good parts at least, and never tell him what's wrong with the Ford because there is a Ford agency down the street and I know he would be pretty sure to go down there and check me out and I'd have a good chance of losing a sale. So if you want to know about my water policy I'll be glad to tell you, but you'll have to talk to Oscar Chapman about his water policy. When President Eisenhower asked McKay to run for the Senate from Oregon, the president appointed Fred Seaton as secretary of the interior. He was an excellent man, in my opinion, who left it pretty much up to the Park Service personnel to do a good job but to keep him posted. In fact, he practically took me in as an adopted member of the secretarial staff, inviting me to their parties when other bureau chiefs were not included. I did the same thing with Fred Seaton as I had done with Doug McKay when he came into office: I called on him, presented him with a resume on the Park Service, and expressed my hopes that he would still want my services as director. Fred Seaton felt the same way about the Park Service as Doug McKay. Seaton had been an assistant to President Eisenhower and was at the cabinet meeting when we presented Mission 66 to the president. The superintendents' meetings in the field provided an effective way of developing comprehensive policies and plans, and the early meetings contributed to the formulation of Mission 66. The 1952 meeting in Glacier did a great deal to breach the change in directorship and develop amongst us a better understanding of each other: we saw that each man's job, each area of the system, each office was very important to a successful total operation. The 1953 meeting in Yosemite brought out the importance of the concessionaires as a part of the team. And it got us thinking of trying to find some way out of our quandry over financing a reconstruction program. It emphasized the need of working out new concession contracts and mending the bad feeling that had developed when in the forties the department's solicitor had told the concessionaires that when their contracts were up, all their investments accrued to the federal government. The Public Lands Committee of Congress then put on record the term "possessory interest" so that the concessionaires investments in the parks placed on government property in accordance with the terms of their contracts had the same legal status as improvements on private properties. Both the Glacier and Yosemite meetings set the stage for a united effort that resulted with the development of Mission 66. By the time of the Great Smokies meeting of 1955, Mission 66 was presented in nearly final form (as described in Chapter 9). 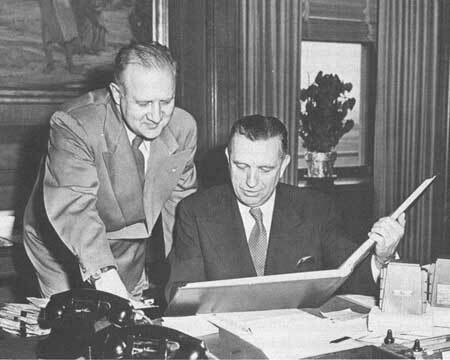 On June 1, 1954, we were finally able to establish western and eastern design and construction offices as recommended by Tom Vint, with Sanford (Red) Hill in charge of the San Francisco office and Edward S. Zimmer heading the Philadelphia office. The regional offices retained a liaison officer who could go out and help the small areas on minor matters, and each of the larger parks had its own professional planners. But the design offices, in accordance with Tom Vint's recommendation and my concurrence, were to handle all design and construction work. In winter the field men would be pulled into the central offices at San Francisco and Philadelphia, and there the landscape architects, engineers, and architects would meet and talk over the past summer's accomplishments and plan the next year's work. This procedure helped greatly in devising detailed master plans. The eastern design office handled almost everything east of the Mississippi, and the western office covered the parks west of the Mississippi. The spirit was running high, and by 1957 when we had our meeting in Yellowstone and Teton I'm sure we all had the feeling that nothing could stop us. We were in our 1958 fiscal year, the program called for $73,794,500, and Congress had given us $76,005,000 in accordance with our adjusted request. Three horsemen start out on a seven-day trip to the Two Ocean Plateau and Heart Lake Basin of Yellowstone National Park; Associate Director Eivind Scoyen, Director Conrad L. Wirth, and Superintendent Lemuel A. "Lou" Garrison. Courtesy National Geographic Society. I arrived in Yellowstone early to work on an article for the National Geographic Society (National Geographic, May, 1958) and one of their writers, Nat Kenney, was with me. We were going on a five-day pack trip. I got sick the second day out and had to turn back. I was laid up in the hospital for several days, and Senator Byrd found out about it. One morning while still confined to bed, I looked out the window and saw the senator and his old friend, Blackburn Moore, the speaker of the House of Delegates of Virginia, coming across the lawn from the hotel carrying a big covered platter. They came right to my room, and on the platter was a Yellowstone Lake Cutthroat they had caught the day before, all fixed up for my breakfast. It was at that time that I prevailed upon Senator Byrd to attend the meeting and say a few words. He told the meeting that his Committee on Finance had made a study of the National Park Service and had come to the conclusion that the service was getting $1.10 out of every dollar appropriated by Congress. That statement was transmitted by both the United Press International and Associated Press and was also printed in the Congressional Record. 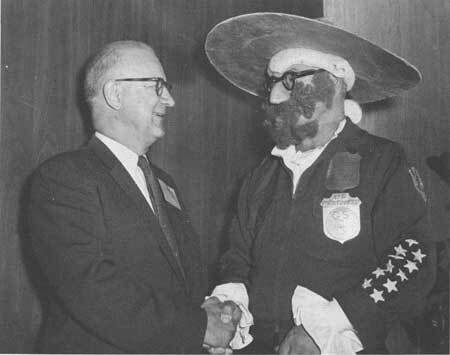 "Ranger Onelick Evergreen," who mysteriously showed up at the superintendents' conference in Grand Teton National Park in 1959, is greeted by Director Wirth and ordered to return to his ranger district as fast as he can. The meeting that started in Yellowstone and ended in Teton was a hard working session. We had some in-house matters to straighten out and we cleaned them all up before the meeting was over, including the problem of housing needs presented by the wives of the superintendents. They were very happy to know that in accordance with their recommendations new houses were being built and many more were financed. We ended the meeting with a skit featuring Ranger "Onelick Evergreen" played by Superintendent John G. Lewis of Isle Royale National Park, Michigan. Also at that meeting I was presented with a scroll signed by over six hundred people. I consider it the nicest thing anybody could have received, because it expressed so well the spirit of unity that prevailed. With unswerving devotion to the principles of conservation, together with perception of the needs for greater public use and enjoyment of the National Park System, you have given unsparingly of your energy and enthusiasm, and through your MISSION 66 Program, have awakened and sustained the interest of the public and their elected representatives to the need for action and appropriations to preserve and develop the NATIONS HERITAGE. Your determination, strength and belief in PARK IDEALS, your unfailing recognition of work well done, your friendly manner and good humor, have won for you and your park family, respect and acclaim. The recognition you have received in the form of Trusteeships, Doctorates, Citations, Distinguished Service Awards, Gold Medals, and other honors are all well deserved. We take pride in their bestowal. By this means, we wish to express our continued ADMIRATION and APPRECIATION, and give you our pledge of FULL COOPERATION in future years. May they be golden years, rich in the rewards of public benefits from the good you are accomplishing. Another honor came my way that year. I had been a member of the National Geographic Society for many years. In 1957 Melville Bell Grosvenor was elected to the presidency and editorship of the society. About two months after his election, he called me and said he wanted to come over with Thomas W. McKnew, then vice-president and secretary, to discuss an important matter. At the meeting they told me they were considering filling a vacancy on the society's Board of Trustees and wanted to know whether I would accept the position if elected. I didn't take more than a split second to say yes and that I would consider it a high honor. Apparently I was elected at the next board meeting, because within thirty days I was informed of the date and time of the first meeting I would attend as a trustee. I consider being elected to the Board of Trustees of the National Geographic Society a great distinction, affording, as it does, a close association with an organization whose purpose and activities I wholeheartedly endorse. I learned after I was on the board that I was filling the vacancy created by the death of Admiral Richard E. Byrd, the renowned explorer and brother of my good friend Senator Harry F. Byrd. I am now also on the society's Executive Committee and its Research and Exploration Committee.